Shape the audio to suit your ears! Fine tune your audio and maximise your enjoyment! The bhi ParaPro EQ20-DSP 20 watt audio unit comes with parametric equalisation and bhi DSP noise cancelling technology. It enables you to fine-tune the sound of your received audio and boost or cut the frequencies to suit your own hearing. 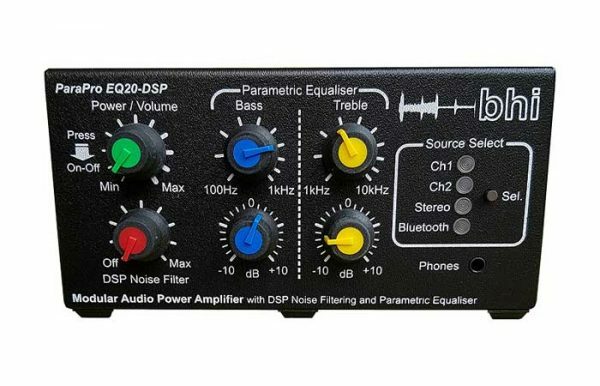 The EQ20-DSP unit features a 10W per channel audio amplifier with parametric equalisation and bhi’s latest dual Channel DSP noise cancelling technology to give you an even better “noise free” listening experience. 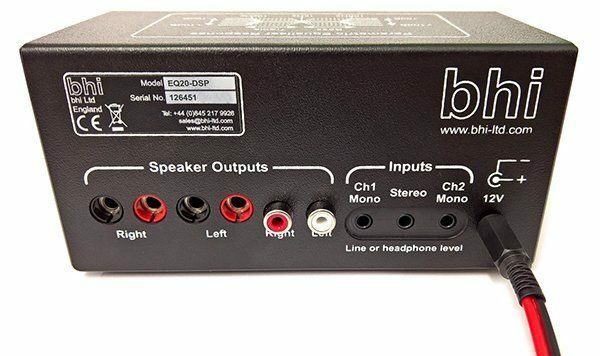 You can connect one or two mono inputs to the CH1 and CH2 input sockets, or a stereo signal from an SDR radio, shortwave receiver, MP3 player etc, via the stereo input socket. Connect passive speakers to the left and right “Speaker Outputs” using the 4mm banana plugs or phono to 3.5mm mono adapters supplied. Use the “Source Select” button on the front panel to select the desired audio. 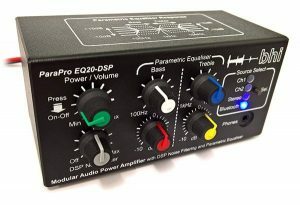 The EQ20-DSP is housed in a quality compact ABS case. 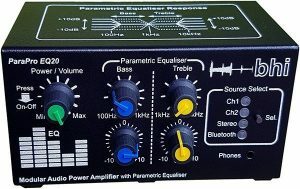 There are controls for Power/Volume along with two parametric equaliser channels labelled Bass and Treble, with the Bass centre frequency being adjustable from 100Hz to1kHz and Treble covering 1kHz to 10kHz. 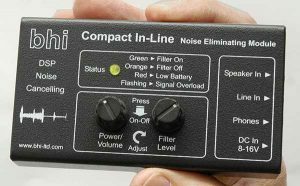 Used together these controls provide two bands of ±10dB adjustment from 100Hz through to10kHz. 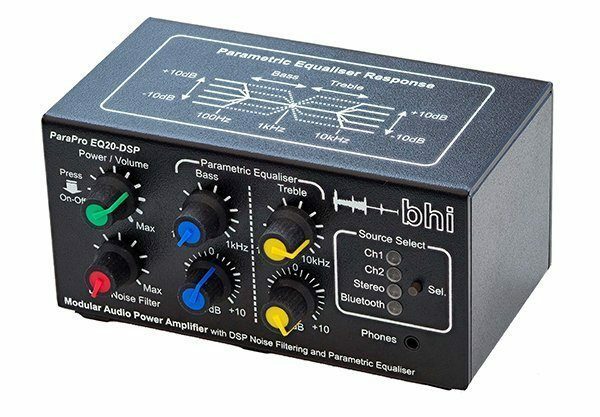 bhi DSP noise cancelling. 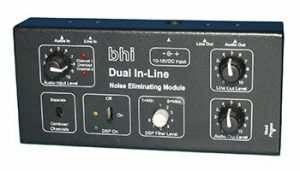 The bhi noise filter control allows you to adjust the filter level from off (DSP bypassed) to 40dB of noise cancellation. 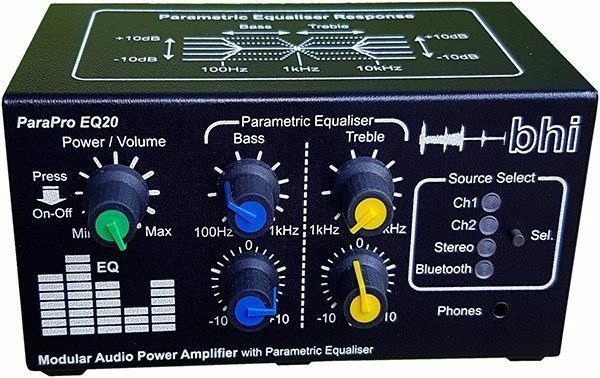 Unlike standard tone control, graphic equalisation and preset EQ settings a parametric equaliser allows you to select the precise frequency you want to adjust. This enables you to boost or cut the selected frequency giving you much greater flexibility and accuracy in setting the audio to suit your own hearing.  This is especially beneficial to people with hearing loss. “Using the new EQ20-DSP noise cancelling and parametric equaliser for a few days I have found this to be an excellent purchase. I am now able to receive stations down in my local noise level which was not possible before due to high solar panel and other local electronic noise. Using the fixed line level output from my ICOM IC7600 and IC9100 transceivers thus bypassing the internal audio stages gives the best results. ( 4.7K 300mV rms )this source is just below the clipping level, the audio having little or no distortion with a frequency range to suit me. Many thanks to Kellie and Graham for the very fast and efficient service.” Best Wishes David G2FT ex G3MWV.